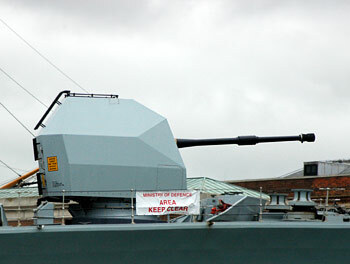 Additional information about the Vickers Mk8 4.5in Gun Graphic: The Vickers Mk8 is a rapid fire radar directed 4.5 inch Naval Cannon fitted to several classes of small to medium warships. The angular shield provides 'stealth' qualities. Siteseen Ltd. are the sole copyright holders of this Vickers Mk8 4.5in Gun picture, unless otherwise stated. We only authorise non-commercial picture use and particularly encourage their use for educational purposes. This Vickers Mk8 4.5in Gun picture is not in the Public Domain. 3) Use of this Vickers Mk8 4.5in Gun picture, or any of our pictures on websites re-distributing copyright free material is strictly prohibited.